we’re heading to vermont tonight for dev’s cousin’s wedding. which means that it’s time to share this very crazy, yet 100% true story. when i was about 12 years old my family lived in new zealand and every summer, i’d go to a one week baha’i kids camp with my friend jasmine. when we got to camp we surveyed the scene. and by that i mean, we looked at all the other camp attendees and tried to figure out who we wanted to hang out with, which at that age usually had everything to do with whether they understood our fascination with american basketball (i was a huge charlotte hornets fan, and jaz loved the chicago bulls). to this day, i don’t really remember how my love for basketball became so fierce at that age (i certainly don’t care about it one iota now), but i definitely remember purchasing my first bright blue charlotte hornets cap, and lovingly bending the rim so that it sat ‘just right’ and then wearing it everyday. #highdorkalert. the camp had its usual suspects that we’d met each year, except for one, glorious exception: brandon moore. brandon more was an 11 year old kid whose family had moved from the states a few months ago. he was everything that i loved about america – baggy jeans, high tops, basketball cap worn backwards, and the iconic california white smile. he also happened to be half black, half white, so his skin was the color of caramel and he had freckles. and curly gold hair. and he LOVED basketball. needless to say, my 12 year old self was instantly enamored. in fact, i’d say this was my first real crush. i remember declaring to jasmine that one day, i would marry this boy. i was convinced. brandon moore got quite a bit of attention at camp. he had a confidence that belied his young age and a certain swagger. i realized i had to turn on the charm pretty heavily if i was going to make him notice me. the only problem was that jasmine also had a big crush on brandon. so there we were – two awkward 12-year-olds who would laugh at everything he said (whether it was a joke or not) and spend our evenings plotting out our outfits for the following day in hopes that the american boy would pay us attention. but alas, being the star of the camp meant that brandon was in high demand, and even though we pulled out all the stops the most we got was his winning smile, and i think during one camp game he and i had to hold hands. (hands i didn’t wash for weeks.) brandon also had a little sister, who was super adorable, and so jasmine and i tried getting on her good side in hopes that her affinity for us would trickle up to her brother, but to no avail. when it came time for brandon to leave camp i distinctly remember him putting his bags in his parents car. the sun filtered down as he said his goodbyes and i honestly felt my heart break in two. i had already watched ‘gone with the wind’ and i felt just like scarlett o’hara when rhett finally leaves her. it was a TRAGEDY and i couldn’t bear to just let my ahem, future husband, walk out of my life so blithely. so i asked brandon if he’d be my penpal. i thought maybe i could woo him with my articulate prose and my handmade envelopes, but i guess he wasn’t really into that sort of thing and he politely declined the invitation. in the final moments as he was about to get in the car and drive out of my life for ever, he turned back to jasmine and i, smiled his heart-melting smile and said “hey, don’t hate me ’cause I’m beautiful”. and with that he was gone. we had no idea what this phrase really meant, but we knew it was cool. that was obvious. i never saw brandon again. rumor had it that his parents had moved back to the states, and no one ever heard from him. it’s no exaggeration that for the next 10 years of my life i constantly wondered whatever happened to brandon moore. when ‘friendster’ came out, he was one of the first people i searched for, and then on myspace. but nothing. it was like he had just disappeared. he was an enigma. one day i was watching fresh prince of bel air and will smith drops the line “don’t hate me ’cause i’m beautiful” and everything came full circle and i realized this wasn’t just a brandon moore saying, but something he’d picked up from american tv. this just made me like him more. fast forward to about 2 years ago. dev and i had just been visiting new york and we were on the plane about to head back to nashville. during our stay in nyc, dev had suggested we visit his cousin kami so we met up with her after her roller derby game. i love meeting dev’s family because mine is so spread over the far corners of this earth, that to meet cousins, aunts, uncles that live within easy visiting proximity gives me a feeling of family that i’d always wanted. as we sat on the plane, ignoring the flight attendants safety instructions, we caught up on email on our iPhones. i noticed i’d just gotten a friend request from kami, so i went to accept it. and that’s when i saw her full name: kami moore. i looked at her profile picture. golden honey colored skin. tight curls. pretty smile. IN CASE YOU DIDN’T GET, THAT LET ME REPEAT IT IN ALL CAPS: DEVON’S COUSIN IS BRANDON MOORE. and not just any cousin, but his dad’s TWIN SISTER’S son. i told dev the whole story and he sat there incredulous. i mean, come on, it’s pretty epic. for a while brandon had hoped to come to our wedding but he wasn’t able to make it, his sister kami was there and so i of course, regaled her with my “i was convinced i was going to marry your brother” story. we finally got to hang out with brandon about a year ago. he lives in california and he looks the same, just a whole lot taller. and although he remembers that camp, he didn’t remember me (so much for my careful camp outfit selection) and so we didn’t really have much to talk about. and well, maybe i made it a bit awkward with my retelling of this story to his ENTIRE FAMILY. 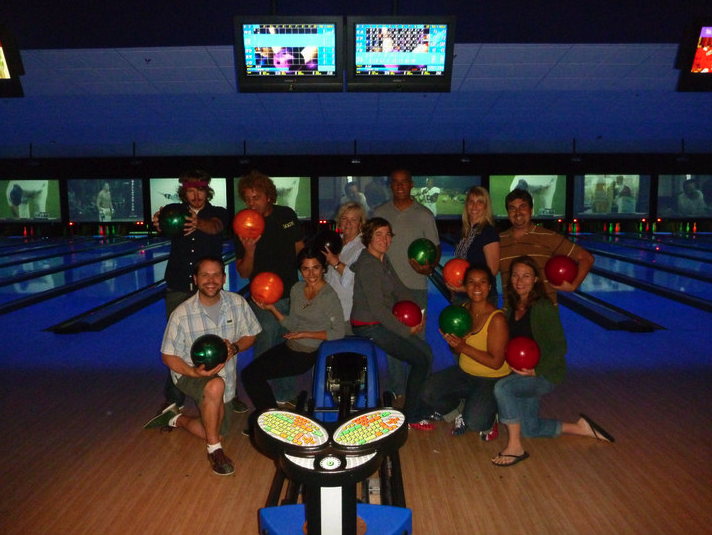 this is a photo of us all bowling/posing. brandon is the guy standing beside dev, kami is in the front right wearing yellow. so this wedding we are going to this weekend is lovely kami’s wedding. and brandon will be there. and luckily for all concerned, my crush is no longer active. ha. and the thing that i haven’t really said out loud to anyone is that i think i recognized a need to know brandon even that that young age – and (hold onto your eyebrows because this probably sounds crazy) i think it was because i was always supposed to find devon. whether it be through my 12 -year-old-crush, or by ending up in nashville – a city i’d vowed i’d never live in. or the fact that my sister bought his CD 5 years ago, memorized every word and told me about him before i had even heard of devon gundry. but throughout my life the universe definitely kept leaving me breadcrumbs directing me to my soul’s mate. and that just blows my mind in the best possible way. That is a crazy story. O__O Small world is small. And there, on the handle of the car door, was a hook! This is cute. Disgustingly cute!! the perfect story to tell the grandkids. on repeat. this made my night. love you. okay. that is one of the BEST stories ever. and i really mean ever. I love re-meeting people from your childhood, especially when they don’t remember you. I went to an out of state dance camp in Oregon when I was a kid, and my best friend for the week was a girl named Alana. At the end of the week, we exchanged addresses (for pen pals!) but never wrote. And I stand up (like the obnoxious 18 year old I was) and practically shouted, “Oh my gosh! Alana! I went to a dance camp in Grants Pass with you, when we were ten! I’m Mary!” and just expected her to completely remember me. have fun in vermont! we were probably there at the same time… my family drove through vermont on our way back from montreal yesterday (saturday). we wandered around burlington & got ice cream at the ben & jerry’s factory. delish. Wow…what an amazingly freaky story. I really enjoyed reading this! this was an awesome read! i love connecting the dots in life. b) A neighbor’s story, about one day when he was showing his wife pictures of his time in Paris…there she was, in the background, years before they’d ever met.